This website uses third party cookies to improve your experience. If you continue browsing or close this notice, you will accept their use. Learn about this website's cookies and how to disallow cookies. are extended until 3 november 2019. Italo Fast Track from Roma Termini and Milano Centrale. Ticket sales to travel with Italo are extended until november 3, 2019. This means being able to plan and increase sales. Do not let your customers miss the chance to travel at affordable prices! NEW CONNECTIONS TO VICENZA, DESENZANO AND PESCHIERA STARTING FROM €9,90. Let your customers discover the new stops on the Milan-Venice route with the incredible offers starting at € 9,90. The new route's stops are Brescia, Desenzano, Peschiera del Garda, Verona, Vicenza, Padua and Venice Mestre with 14 connections a day starting from Central Milan and from Venice S.Lucia, some trains departing from and to the stations of Turin. Your customers will reach the two city centers in just 2h25' of travel. ITALO STOPS ALSO IN BOLZANO, TRENTO AND ROVERETO. For your customers who want to travel in northern Italy choose Italo! The cities of Bolzano, Trento and Rovereto will be connected to Rome, Florence, Bologna and Verona. Italo is the best way to travel in Italy! DISCOVER THE BEST WAY TO TRAVEL TO NAPLES. - 42 rail links: connecting Turin, Milan, Reggio Emilia, Venice, Padua, Rovigo, Ferrara, Brescia, Verona Bologna, Florence, Rome, Salerno. - 1h7’ from Naples to Roma Termini. - 4h15’ from Naples to Milano Centrale. TRAVEL TO FLORENCE WITH ITALO STARTING FROM €9,90. Discovery Italy by train!. 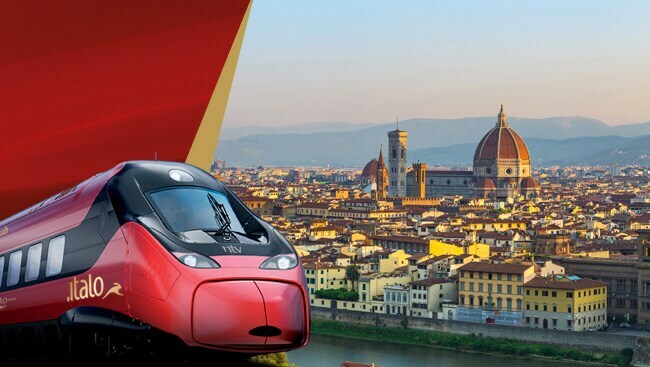 Choose for your clients the convenience of Italo to reach Florence train station starting from €9,90! - 55 rail links: connecting Bologna, Verone, Rovereto, Trento, Bolzano, Ferrara, Rovigo, Padua, Venice, Reggio Emilia, Milan, Turin, Rome, Naples and Salerno. - 1h20’ from Florence to Roma Termini. NEW LOUNGE ITALO CLUB IN VENICE SANTA LUCIA. - hot and cold drinks and tasty snacks for aperitifs Made in Italy. Access is allowed up to 3 hours before the train departs. In Venice Santa Lucia the Lounge is available from 6.45 to 20, with a ticket in Prima the cost is € 10. The holders of Italo Più Corporate card can access it if they hold a ticket in Prima and Italo Più Privilege. WITH ITALO'S FAST-TRACK SERVICE, LEAVING FOR A NEW DESTINATION TAKES ON AN EXCLUSIVE VIBE! With Italo, travelling from Rome and Milan has a pleasant surprise for you: Our new fast-track service which enables passengers travelling in Prima and Club-Executive ambiances to gain access to the train platform from an priority entrance. -Special entrance for Italo passengers on platform 12 at Roma Termini and platform 19 at Milano Centrale.